Dhegdheer can host a single program. Lower the install cost of programs you install on Dhegdheer by 1. The memory cost of the hosted program does not count against your memory limit. Dhegdheer's middle ability is worded like a conditional ability that triggers after the install action. Does Dhegdheer actually reduce the cost to install programs on it? Yes. Interpret the text as if it read "Lower the install cost of programs you install on Dhegdheer by 1." If you ever wanted to install a Hyperdriver and Endless Hunger at the same time Dhegdheer (female cannibalistic demon from Somali mythology, if you're curious) is for you. 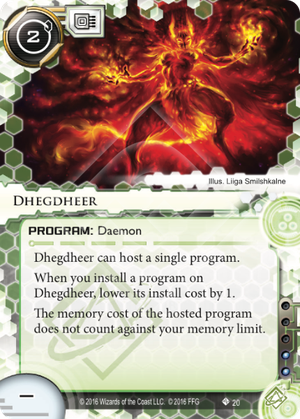 There really isn't all that much interesting to say about Dhegdheer, it's a simple card that does exactly what it says on the tin: it saves you MU. That, of course, matters mostly with cards that either take up multiple MU (e.g. Magnum Opus) or free MU benefits you (e.g. Deep Data Mining). When hosting a 2 MU card Dheghdeer is cheaper than two Akamatsu Mem Chips due to the discount on install. When hosting a 1 MU card the two are equally expensive. That's not bad. The mem chips are easier to install with regard to ordering however, you can install a memchip while at 4MU with 3 programs (including a Magnus Opus) installed to gain some free MU but if you want to use Dhegdheer for that same Magnus Opus you have to delay installing it until after installing Dhegdheer. Because Dhegdheer only hosts a single program it isn't terribly vulnerable to program sniping in the way a Leprechaun with two programs is. Do watch out for Best Defense though if you have a couple of tags, although, let's face it, a sniped program is probably the least of your worries in that scenario. Since the install cost reduction on Dhegdheer is per install you could potentially use it for a really janky Chameleon play. In Kate that lets you change the Chameleon breaker type every turn. Like most cards Dhegdheer will not be a common card, but for decks built around the gotta-have-free-MU it's a strong candidate.